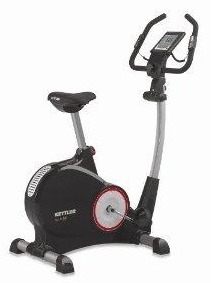 The Kettler HKS Polo M exercise bike is a smooth machine with quality components and solid engineering. It stays away from frills, keeping it simple with an easy to use display to help you crank up the workout time and burn the calories. The Kettler HKS Polo M exercise bike has a large digital LCD display showing time, speed, RPM, distance, and heart rate, and it also has a Scan Feature of the feedback. The adjustable padded handlebars with heart rate hand sensors rotate to almost any angle for a variety of grip positions. The frictionless magnetic brake system provides smooth performance and up to 10 settings of resistance. The Kettler HKS Polo M has a sturdy, powder-coated, high-carbon steel frame, as well as sealed ball bearings for a smooth and maintenance-free operation, and a Poly V belt drive system that eliminates the need for a noisy bike chain that requires lubrication. The Q-factor pedal spacing width of 7.5" provides a correct biomechanical fit, and the extra-wide and thick padded saddle allows the user to exercise in optimum comfort. The German-made Kettler HKS Polo M can measure heart rate in three ways: by using the telemetric handgrips, using a wireless heart rate chest strap (optional), or with an infrared earlobe clip sensor (also optional). Although the HKS Polo M has an adjustable seat post, current users are advising would-be buyers that the seat won’t lower far enough for a shorter person. Also, the exercise bike is easy to assemble but comes only with illustrations and no written instructions in English. The Kettler HKS Polo M exercise bike is lightweight (60-lb) and portable, very well made, and has the durability of a bike costing twice as much. The large LCD display is easy to use, and the belt drive and good size 15.4-lb flywheel make this model very quiet and smooth for a home model. Priced at just $549, it will meet or beat your expectations.